Research and practice demonstrate that strong, positive relationships with parents and other adults play a protective role for children, independent of family circumstances.3 Developing parents’ and caregivers’ skills to parent more positively and effectively is one way to lower family stress and promote healthy brain development. For additional information on ways to support children through supporting families, see Two Generation Lens: Helping Children by Helping Families. For additional information on opportunities to further research in this area, see Investing in Early Childhood Innovation: Q&A with Dr. Jack P. Shonkoff. Parent Corps, which was developed by Dr. Laurie Brotman at NYU, works with public school pre-kindergarten parents and teachers on parenting and supporting children’s learning. Triple P Parenting provides a curriculum and materials on parenting for interested non-profits or local government agencies. The program itself is a for-profit entity, and although it provides training for implementers, it does not implement directly. Not surprisingly, there is a strong association between poverty and many of the known sources of toxic stress.4 With one in four children under five in the U.S. living in poverty, over six million children are at risk of not reaching their full potential.5 Improving family incomes and access to services is another way to ensure better health and education outcomes for children. Maternity Care Coalition is a Philadelphia-based nonprofit that provides a range of support services for mothers and young children (0-3), including home visitation and Early Head Start. Avance has a primary target of improving parenting and brings parents together in a workshop format. Avance also includes a home visitation component, however, and links families into other services. Healthy Families America is a home visitation program that builds parenting skills and connects families to additional services. Child First has a primary focus on relationships and mental health, and uses a home visitation model to work with families who have been referred through some aspect of the health or child protective welfare system. Child First also connects families to additional services as needed. Tulsa Career Action Project provides high quality childcare and preschool for children, while simultaneously providing health, financial, employment, and other community-based services for parents. Single Stop helps low income individuals and families access a range of available benefits and services for which they are eligible, but may not know about or have the capacity to apply for without assistance. The Build Initiative works with state and local governments to design comprehensive early learning systems to meet the needs of both children and parents. A concrete example of this type of work in Pennsylvania: unifying information about different early childhood programs and funding streams into a single state database. Harlem Children’s Zone is one of the best-known ongoing experiments in geographic targeting of services to children and families. HCZ is a non-profit entity that has undertaken the coordination of both public and non-profit services for families within a low-income section of Harlem. Annie E. Casey Foundation’s Atlanta Civic Site Initiative has neighborhood focused, multi-dimensional programs to assist children and families in both cities through both direct support and coordination of existing services. Children’s Services Council of Palm Beach, Florida was created as a special public entity to undertake the work of better coordinating services for children in the Palm Beach area. 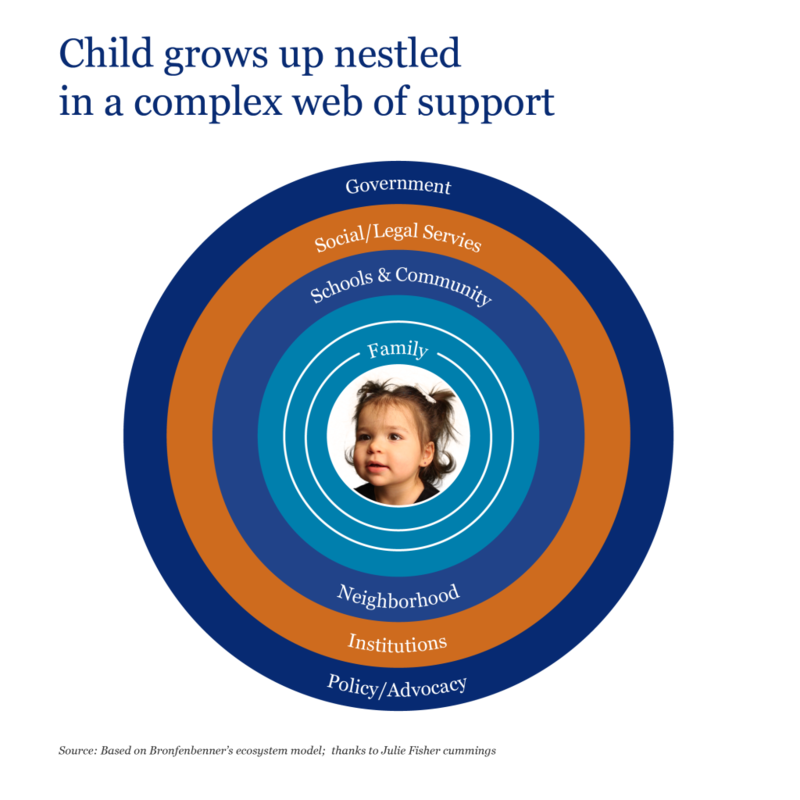 This organization also partnered with the Center for the Study of Social Policy to form LINC, a coalition of localities focused on better coordination of early childhood services. The federal Department of Education’s Promise Neighborhood initiative provides seed money to encourage better coordination of services at a local level; some funders have also focused on a particular geographic location as a strategy to ensure better coordination. Early Learning Nation is a coalition of municipalities dedicated to expanding and improving early childhood services and outcomes. Their website includes helpful information on mapping needs at the community level. For more information on ways funders can engage with the public sector to improve early childhood outcomes, see Patching the Quilt: Early Childhood Policy & Finance for Donors. 3See, for example: Shultz et. al: The relationship between protective factors and outcomes for children exposed to violence. RAND. Violence and Victims: vol. 28, no. 4, August 2013. 6Kids Count Data Base. Number of children under 5 living in poverty in 2012 estimated at 6,052,000 or 26%. Original data source: U.S. Census 2000 plus American Community Survey 2012.